The same humidifier design can be altered slightly and become a power humidifier. 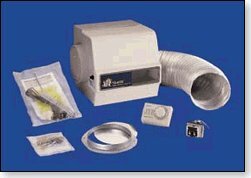 With a larger cabinet and no duct to the return plenum, a fan moves air across the wet drum or wet screens and blows it back into the supply plenum. Heat pump and electric furnace air is not warm enough to evaporate water as easily as a fuel burning furnace, so a steam humidifier is needed. Fabricated of metal, a float valve keeps the required amount of water in the reservoir. Mounted in the return or supply ducts or plenums, line voltage current is passed through a heating element immersed in the reservoir to make steam. The control wiring will include a switch to turn the blower on during operation for increased humidification even when the thermostat is not calling for heat. Airstream humidifiers mount in the bottom of a supply duct. Shaped like a half of a watermelon to form a reservoir, a float valve maintains the proper water level. Discs made of screen rotate with the help of a motor into the water then around into the warm air stream to allow the water to evaporate. Two types of humidifier spray water directly into the warm air duct while the air is flowing. One uses the ultrasonic principal to atomize water droplets for evaporation. Tabletop versions of this design are known as cool mist humidifiers. The other spray type uses air and water pressure mixed in a nozzle to atomize the water similar to an aerosol spray. These designs are effective, but any minerals dissolved in the water will drop out as solids and collect in the ductwork or be blown out the supply registers as a fine powder. The earliest furnace humidifiers were ceramic wicks stacked in a tray of water that was suspended over the heat exchanger in the supply plenum. Very few if any of these still exist, going the way of the old furnace that has been torn out and replaced over the years.